Process types within AgileMinutes provide a categorization of the minutes’ issues. They do not have to be interconnected to a JIRA-Issue Type. Just in case they shall be exported it is necessary to specify a corresponding issue type within the project settings. The further is the case with the process types “Info” and “Appointment”, the latter is the case with the type “Task” which should be tracked in the JIRA issue navigator. To define those settings you have to go to “Meeting minutes / View Meeting Minutes” in the menu on the top. Select “Project Settings” in the menu on the left. On the issue type screen you see all available issue types for the current project listed. To edit an Issue Type click on the edit button with the pencil icon 2. 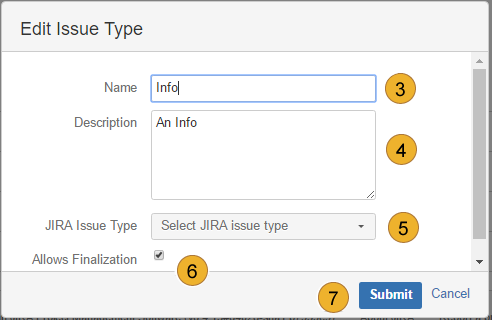 In the opening “Edit Type Issue” form you can specify the original name 3 and the description 4 of that issue type and the corresponding JIRA issue type 5 in the drop-down menu at the bottom. If you select an issue type, for example, „Task“ or „New Feature“, then the corresponding meeting issues of this type will be exported into the JIRA-System. Available issue types are different for each project and can be set for each project in a distinct way. Each JIRA issue type can be chosen for more than one project. Tick “Allows Finalization” 6 to finish the meeting minute regularly. After filling the form click “Submit” 7 to finish the editing process. Now you can see a list of your edited issues. Execute this step for all projects which you want to connect with JIRA. Click on “Manage translations”-button 8 to proceed with the configuration. In the form “Translation for Issue Types” you can specify how the names of the issue types and their descriptions should be translated into other languages in which AgileMinutes might be used. You can choose another language (German, English, French, Japanese or Spanish) from the drop-down menu 1 and click on “Select language” 2. In the next step you can enter the translations for the various issue types in the text fields below 3. For example, you can determine that your issue type called “Info” should be translated into German as “Information”, or “Draft” as “Entwurf”. After defining all necessary translations click “Save” 4.